So what I didn't say in Thursday's post is that as well as consuming rather a lot of cheese, I was also on the vino! First proper time this year, so by the time Friday rolled around the last thing I wanted to do was go out. Joe, who thinks out of the box more than me, persuaded me that the perfect Friday night dinner would be take away, and pointed me in the direction of The Red Sea Restaurant, a Lebanese restaurant/takeaway on Roundhay Road. I checked online and it seemed to have some pretty good reviews, so we gave it a shot. The menu isn't huge, and if ordering online, the menu on the website does not exactly match that on the ordering site. Not to worry though, there is plenty on there anyway. 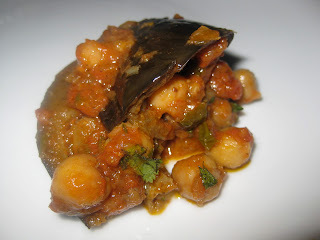 We started with Mossaghat Bethenjan,which is fried aubergine with onions, peppers, chickpeas, parsley and mixed spices. It was nicely flavoured with cumin and cinnamon and came with a huge naan bread. It may also have converted Joe into an aubergine fan which is excellent from my point of view! This was followed by Chicken Mousahab, boneless chicken marinaded in lemon, garlic and olive oil and served with fries and salad, and Sweet Lamb and Sultana Tagine with rice. The lamb tagine (admittedly Moroccan) was an absolute treat - succulent lamb on the bone with a well spiced sauce full of cinnamon, cloves, cumin, honey and mango. We also liked the chicken, but it wasn't nearly as interesting as everything else and was slightly overdone. The chips weren't great either. A word of warning to anyone thinking of ordering from there - we chose an extra naan (not really thinking we were getting one with the starter) and they were both huge (but very good). The online ordering menu also doesn't specify the lamb came with rice, so we ordered another one of those. There was definitely no need - the rice is enough to feed four and we had tons! All in, I would go back there, but I'd probably stick to the slow cooked dishes as the lamb definitely outshone the chicken. Thursday - Homage2Fromage @ Primos!! !